Saint Augustine was a remarkable fellow and known as one of the most significant Christian ‘thinkers’ since the time of Saint Paul. Aurelius Augustinus (his latin name) was born in 354 in Tagaste, a small Roman community near the coast of Algeria; his mother was famous holy woman named Saint Monica, and his father a pagan man of good reputation. Augustine began his adult life as a teacher and soon became a ‘Professor of Rhetoric’ in Rome , the premier science for the Roman gentleman at the time. Augustine had a true talent for writing and philosophy but after many years teaching he became restless. After much soul-searching, at 28 he returned to his home town and lived his life as cultured squire; looking after his family property and continuing his literary interests. Augustine was also raising his son, Adeoatus at the time, left to him by his long-term lover (her name unknown), taken from the ‘lower classes’. Sadly, whilst still only an adolescent, Adeoatus then died and thus with no heir to the land, Augustine sold the family property and found himself, much against his will, pressed into religious service as a junior clergyman. And so the transformation to Christianity began for Augustine. Although he had dabbled in various Christian religions from an early age and was brought up with Christian beliefs by his mother, Augustine had lived a hedonistic lifestyle. He had never bothered to be baptised Christian because he thought he could never lead a pure life. One day he heard about two men who had suddenly and passionately converted after reading about the life of Saint Antony, and he was ashamed. Augustine was sure God had intended him to hear those words. He picked up the book of Letters of St Paul and read the first passage that his gaze fell upon; it was a passage declaring one to “put away all impurity and live in the imitation of Jesus”. That was all he needed to begin a new life. Augustinus Aurelius was thus baptised and soon ordained as a priest in 391, a role in which his unique literary and intellectual abililities set him apart from his contemporaries. 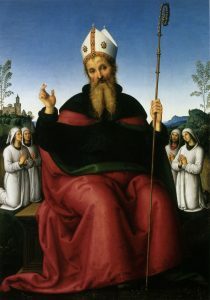 Augustine eventually became a Bishop in 395, was the founder of religious priests, a great writer of Catholicism and arguably one of the greatest saints that ever lived. The life he now lived was true to his beliefs; he practiced great poverty, supported the poor, overcame heresies and prayed with vehemence right up until his death on August 28th, 430. He was 75 years of age. This day is now celebrated as a ‘Feast Day’ by Catholics around the world. Most of us know Joseph as the husband of Mary and the ‘foster’ father of Jesus, but what else do we know about him? Everything we know about Joseph comes from the Scriptures. Joseph was born in 90BC in Bethlehem, and was a beautiful and righteous man. Kind and compassionate, when he found out Mary was with child after they had been betrothed, his compassion and love for her saved her from the shame of stoning, a common punishment of the time. Joseph instead sent her away to prevent her from being accused of adultery. When the angel came to him in his dream and told him not be afraid to marry her because the child in her womb was conceived by the Holy Spirit, the son of God, Joseph showed faith and did what the angel told him. When the angel later came to tell him that his family was in danger, he immediately left everything he owned, all his family and friends, and fled to a strange country with his young wife and infant, Jesus. He waited in Egypt without question until the angel told him it was safe to go back. His faith was steadfast. Joseph was a hardworking man, a Carpenter by trade. We also know he loved Jesus, his primary concern was the safety of this little child entrusted to him. Joseph uprooted his life and settled in the obscure town of Nazareth out of fear for his ‘foster’ son’s life, a child he treated as his own. We also know Joseph respected God. He followed God’s commands throughout Mary’s pregnancy and we are told he took his family to Jerusalem every year for Passover, something that could not have been easy for a working man. As Joseph does not appear in Jesus’ public life, at his crucifixion nor his resurrection, many historians believe Joseph had died before Jesus entered public ministry. According to the Scriptures, the Apocryphal date of his death was 20th July, 18 AD, in Nazareth. Joseph was said to have passed away peacefully in the arms of Jesus and Mary. 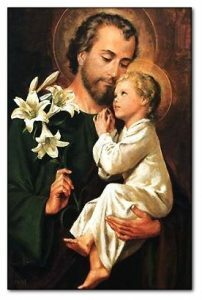 The life of St Joseph is celebrated with two Feast Days; March 19th marks ‘Joseph the Husband of Mary’ Feast Day, whereas May 1st marks the Feast Day for ‘Joseph the Worker’. Patrick’s captivity lasted until he was twenty, when he escaped after having a dream from God in which he was told to leave Ireland by going to the coast. There he found some sailors who took him back to Britain he was thus reunited with his family. Patrick was soon ordained as a priest by St Germanus, the Bishop of Auxerre, whom he had studied under for years. He was later ordained as bishop and sent to take the Gospel to Ireland. Patrick arrived in Sland, Ireland on March 25th, 433. There are several legends about what happened next, with the most prominent claiming he met a chieftan of one of the Druid kinfolk, who tried to kill him. After an intervention from God, Patrick was able to convert the chieftan and preach the Gospel throughout Ireland. There he converted many people – eventually thousands – and he began building churches across the country. 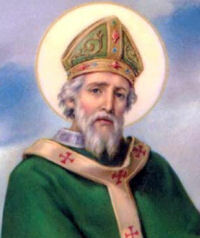 He often used shamrocks to explain the Holy Trinity and entire kingdoms were eventually converted to Christianity after hearing Patrick’s message. Patrick preached and converted all of Ireland for 40 years, ordaining over 5000 priests, consecrating 350 Bishops and building over 700 churches. He worked many miracles and wrote of is love for God in Confessions. Sadly, after years of living in poverty, traveling and enduring much suffering, he died at Saul on March 17th, 461. Patrick is believed to be buried in the cathedral of Downpatrick, County Down, Ireland; his grave marked in 1990 with a granite stone. St Patricks Day is celebrated around the world on the day of his death.